Deep in the Himalayan mountains in the Dolpo region of Nepal, the stone village of Tsharka perches above river banks, surrounded by fields of barley. The people of Dolpo – Dolpo pa -- are Tibetan in culture, language and religion, though they are divided from Tibet by national political boundaries. To reach Tsharka, one treks through wide valleys, over high mountain passes and across steep gorges and ravines. Chortens, religious shrines, stand as sentinels along the path that lead from one valley to the next, witnesses to the spirituality and fragility of life in Dolpo. When Barbara Euser and her two daughters, Laney and Piper, traveled there in July, village elders exhorted Barbara to help them open an elementary school for the village children. They promised that the community would do everything necessary to support a school. If they could get the materials, they would build the school themselves. If they could have teachers and books, their children could learn to read and write. Before leaving Tsharka, Barbara agreed to help the villagers build their school through the International Community Development Foundation, sponsored by her family. In a ceremony attended by the villagers, Barbara presented a letter of commitment to the headman, Tsering Phurba. 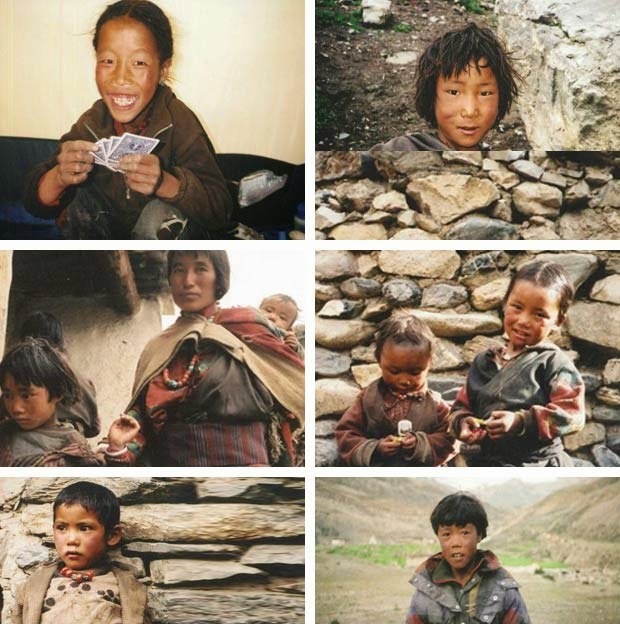 The Bon Lama of Tsharka, Lama Tashi, told them another woman had also agreed to help Tsharka build a school: Leona Mason. In August 2003, Leona arrived with a large tent and teaching materials and ran a school in the tent for the rest of the season. Working together to find partners and funding for a school in Tsharka, Leona and Barbara obtained a matching grant from the non-profit organization Room-to-Read. It was the most remote region in Nepal in which Room to Read had ever attempted to build a school. The enthusiasm of the villagers convinced Room-to-Read to make the effort. Room-to-Read provided building materials and the villagers provided all the labor. Village men and women carried stones and cement and planks of wood to the building site. Working through the summer of 2004, they constructed a school of adobe and stone, comprising six rooms and a courtyard. With the cooperation of Marin Sunrise Rotary Club and Rotary Kathmandu Metro, a matching grant through the Rotary Foundation purchased tables, benches and chairs, books, stationery, and basic hygiene supplies (toothbrushes, toothpaste and soap). Everything for the school had to be transported by truck as far as the roads went, then by horses and porters the rest of the way. Leona and Barbara hired two teachers who spoke Tibetan, the mother tongue of the village children, to teach at the school. Once the school building was complete, the Nepali government sent a headmaster. Tsharka village school, officially Chharka Bhot Primary School, opened in 2005 with 37 students. In 2006, there were 54 students, and in 2007, 60 students. The capacity of the existing school is 65 students – which permits one child from each household in Tsharka to attend school. In 2010, with a grant from the non-profit organization Drokpa, a small greenhouse was built. Teachers use it to teach students how to grow vegetables -- practical science classes. This summer, I traveled to Tsharka to visit our school. It was a challenging trek and I rode horses to the tops of the high passes we crossed. 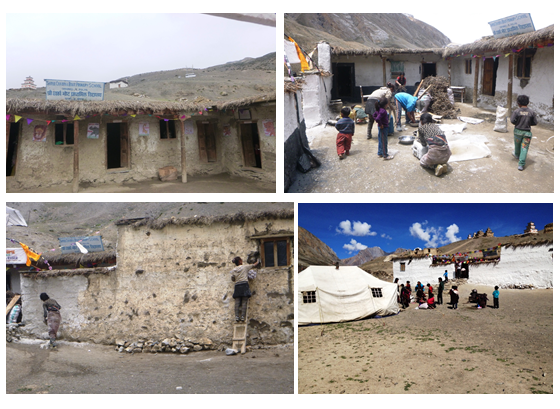 I was again impressed with how remote the region of Dolpo -- and especially the village of Tsharka -- are. After seeing dozens of photos of the school as it was being built, and as it functioned through the last decade, this was my first chance to see it in person. The school is working very well. Our philosophy has always been that the school is essentially the teachers and the students and the information that flows between them. We have an excellent team of teachers, led by Samdup, our school coordinator. 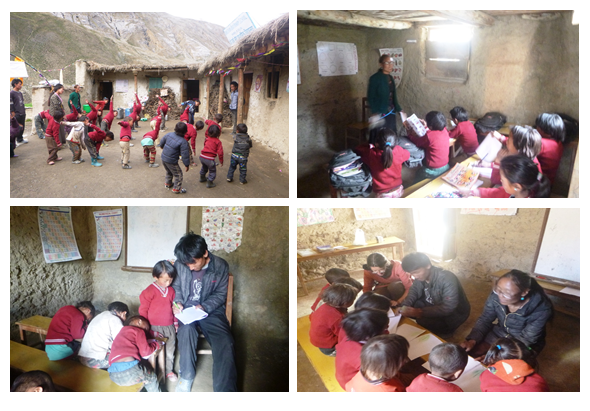 Tsering, Ts'ang, Thukpen, and Samdup are all in their twenties and are energetic, enthusiastic, capable teachers. They are all originally from Tsharka, so they have deep ties to the village. They all live and teach in Tsharka because that is where they want to be. The school building is in reasonably good shape. Like any adobe building, it requires regular maintenance. Samdup is organizing needed roof repairs this year. While I was visiting the school, the teachers and villagers spent a full day whitewashing the courtyard and exterior of the school. In the courtyard, they created a dark wainscoating and outlined the doors and windows. The school looks almost elegant! With fresh clear plastic covering the windows, classrooms are brighter. A new project is to cover the dirt floors of the courtyard and classrooms with locally available slate stone. Once the roof is repaired, the classrooms can be whitewashed, too. We have forty-seven children enrolled in school this year. The school building was designed for sixty students, and we will reach that number next year. Based on a survey of families Thukpen conducted last year, the seventy households in the village have one hundred and twenty school age children. Of those, about forty children are being sent to school in Kathmandu or India. So there are eighty children that could be enrolled in the village school. Reaching all the children in Tsharka village is our goal. The Village Development Committee agreed to let the school use the two smaller rooms of the three-room community building this year. The community building was built on the school property. 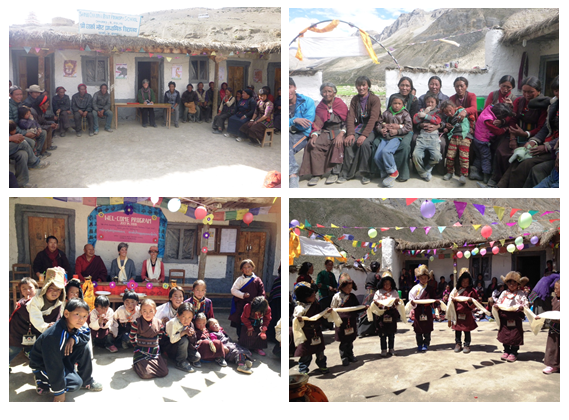 The two women teachers, Tsering and Ts'ang, and the school cook, Sonam, share one bedroom there. The other room is being used as a bedroom by six students whose parents approached the school and asked if the children could stay at the school temporarily while their parents collected yartsa gumba. The children eat their meals in a classroom at the school. Samdup put Tsering in charge of the hostel students. Sonam cooks their meals along with the teachers' meals. Other parents would like to leave their children temporarily in the care of the school, while they are away from the village. Tsharka School is a village school, not a boarding school. We want the children to live with their families in the village and grow up in their community. However, we may find that creating a temporary hostel will give more children a chance to attend school during the yartsa gumba season. Based on the experience we have with the tempoary hostel arrangement this summer, we will be able to make decisions for next school year. En route to Tsharka, I spent a few days in Dunai, the government administrative center for Dolpo. I met with officials in the District Education Office. Each year, the DEO is supposed to supply two teachers to Tsharka school. In the history of the school, only one teacher, Mr. Lamsal, who was designated Headmaster, ever showed up in Tsharka. This year while I was visiting, Mr. Kamal, currently designated Headmaster by the DEO, arrived. If Tsharka school can benefit from support from the Nepali government, that would be wonderful. However, the only reason we have a functioning school in Tsharka today is because ICDF pays the salaries of our four teachers. We need to continue to support and encourage our teachers. We want them to excell at teaching -- and reach out to the community to encourage all the village children to attend school. During my visit, I met with the parents and teachers one day, all interested villagers another day, and the School Management Committee my last day there. I emphasized ICDF 's commitment to paying the teachers' salaries, with the understanding that the community will contribute by maintaining the school building. Before I left, Samdup and our teachers organized a gala celebration with students dances and presentations. Lama Pema, Amanda Christi (a Irish educator with whom I traveled), and I were honored guests. We have a potentially strong school in Tsharka. We can continue to build on that foundation! Please help us with your contribution at the website for the International Community Development Foundation (ICDF) at icdfdn.org. Tsharka (Chharka) School is becoming stronger and more prosperous each year. In 2016, School Coordinator Samdup Tsering began a building project: four new classrooms are under construction. When they are finished, the school will be able to accommodate more than the sixty students currently enrolled. The building foundations and walls were constructed in 2016. Roofing materials arrived on horses too late during the 2017 season to be installed. The plan is to finish the classrooms in May 2018 so they may be used for the majority of the 2018 school year. Foundation stones were collected from the river -- backbreaking work. The stones were stored in piles, ready to begin construction. The walls of the new classrooms are built of adobe. Wood for the window and door frames had to be carried on horses over the high passes, as Tsharka is located above timberline. The new classrooms were covered with plastic tarps to keep them from being damaged by the winter snows. In 2018, the metal roofing will be installed and the students will have a more comfortable place to study. The children of Tsharka village will have a brighter future if they can receive a basic education in a local school. The teachers who have come back to their village to instruct the next generation provide excellent role models for the village children. We need your help to pay the salaries of the teachers for the school and to maintain the school for the benefit of the students. Salaries in Nepal are relatively low: $2,000 pays the salary of one teacher for one year. Even a small donation will help keep the school running. An individual student sponsorship is $120 per year, only $10 per month. This amount helps pay for the costs of the child’s education. We also have an Endowment Fund. A contribution to the Endowment Fund will be invested and only the annual interest from that contribution will be used towards school operating expenses. A gift to the Endowment Fund will give perpetually into the future.